I became the Ad Hoc Intermediate Ride Leader for the second intermediate ride at CT NEMBA's Fall Fiesta at Gay City State Park on Saturday, September 19th. The ride started out with a mix of abilities led by Al Tiniti, CT NEMBA Secretary and local Glastonbury/Hebron riding legend. At one point the less experienced riders in the group decided to head off on their own with Al to show them some interesting local trails which put me in charge of the rest of the ride. 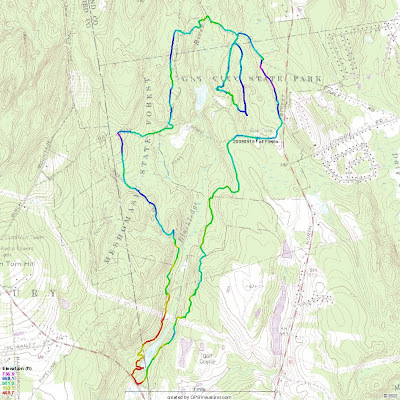 The planned route for the Fall Fiesta was marked with blue trail markers which was intended as a mixed ability route. Interspersed were Hero loops to give the more advanced riders a little more challenge on what I would consider a pretty challenging trail. One such loop shown at the top of the map above was really cool and he rode it twice, too. There was really cool technical decent on the trail that led to an armored, raised stream crossing. Those were some really big rocks that were maneuvered into place. Below is a little video of two of the guys in our ride group going over this rock bridge. The first rider's name is Mark and he is riding an orange IF (Independent Fabrications) steel hard tail. The next rider is all the way from Beacon, NY and is riding a GF Cake. After the second loop on this Hero course, we continued up the Red Trail and at the first climb, we lost the first person in our group, Joan pictured up above on a sweet, personally autographed by Gary Fisher, full suspension 29er. Of course, it wouldn't be a NEMBA ride without a mechanical. In this case one of my quick links broke so I replaced it with another and hoped that it would hold. I know I have said this before but it's time to get a new chain! At one point we diverted off the signed route and started heading south. I remembered riding this way a few years ago and wanted to try it again. At the gas line, we lost another member of the group, Tom who rides a Green Voodo Canzo 29er. After crossing under the a power lines we ventured into Black Bridge Park. I thought there might be a trail that would keep us from having to go out onto Rt 94 but it turned out it was a fisherman's trail that led to the dam. So we back tracked, got out onto Rt 94, and rode the hardball for 50 yards to the next trail head. This trail started out as an old cart path and then turned into some awesome single track. About halfway down the trail is when Steve's chain broke. Two broken chains on one ride! I was all out of quick links, having used my last one on this ride and gave Paula two on the ride at Millers Pond two weeks ago so Steve pulled out his CT NEMBA Trail Ambassador multi tool and fixed his chain lickety split! 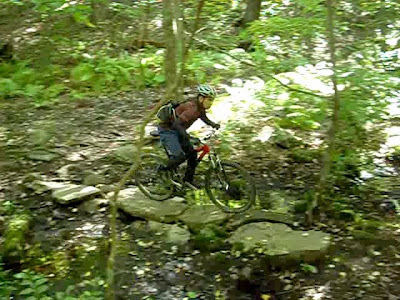 We hooked back up with the main trail at Gay City, ran into the Epic Ride that was returning from Case Mountain and rode back to the parking area. The Garmin Edge reported that the length of the ride was 10 miles!